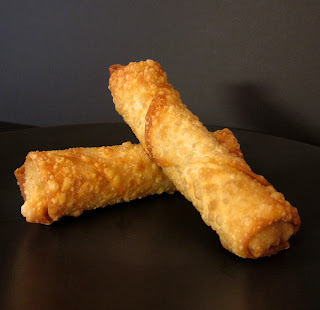 Egg rolls - those ever popular, crunchy packets of deliciousness. Mmm mmm! So good to eat, surprisingly easy to make! Years ago, my husband ordered something called Black Pepper Chicken from a Chinese fast food place. The quality of the chicken was questionable, but the sauce was fantastic. I immediately wanted to make a chicken egg roll with that kind of flavor. And here we are! The sauce I made is adapted from a recipe on food.com. A note: the recipe instructs you to poach the chicken in chicken broth. The results are tender and flavorful - great in the rolls. You don't have to poach the chicken, though. You can chop it small and stir fry it in about 1 tbsp of oil. You can use grilled, broiled, or sauteed chicken. Or, you can even use store-bought rotisserie chicken if you're pressed for time. Egg rolls are all in the wrapping. The first time I made egg rolls I didn't have folding instructions and the results were...less than desirable. The recipe below includes a wonderful diagram from Twin Dragon. Now, rolling is a snap! So, next time in you're in the mood for Chinese food, don't order out! Fry up a cruncharific batch of these homemade egg rolls! 1. Place the chicken broth and chicken pieces into a medium/large saucepan (the liquid should cover the chicken). Bring the liquid to a boil over high heat. Reduce to a low simmer and cover. Poach until the chicken is cooked through (using a leave-in digital thermometer is helpful). 2. Transfer the chicken to a plate to cool completely. Once cool, chop the chicken into small pieces. Cover and chill until ready to use. 3. In a small bowl, stir together the oyster sauce, soy sauce, black pepper, mirin, and garlic. Cover and chill if not using right away. 4. Heat the oil in a large skillet until very hot. Add the water chestnuts, 1 cup of the cabbage, and the green onions and stir fry for about 30 seconds. Add the sauce and continue cooking for about 15 seconds. Remove the pan from the heat. 5. Stir in the remaining 1 cup of cabbage and the chicken. Stir to mix thoroughly. Transfer the mixture to a bowl. Allow the mixture to cool to luke-warm (if the chicken was cold, you may not have to wait). Alternately, you can cool the filling completely, cover, and chill for later use. 6. Follow the diagram below to assemble the rolls (use about 2 tbsp filling in each). You can make them in advance: place the assembled rolls in a parchment or wax paper lined baking sheet or dish, cover, and chill until ready to fry. 7. Line a baking sheet with a few layers of paper towels. Heat oil to 350° in a fryer or dutch oven. Fry the egg rolls (careful not to crowd the fryer - the rolls should not touch). Fry, turning to cook evenly, until golden brown. Transfer the cooked rolls to the paper towels to drain. Repeat.